What does Pre-Party Protect contain? How do I use Pre-Party Protect? How long does a bottle of Pre-Party Protect last? Blood is purified' by the liver daily, removing harmful waste from the blood and making the liver the major detoxifying organ. The digestive system forms an intimate co-operation with the liver. When we consume alcohol and rich foods, they need to pass first into the stomach, then the pancreas (which secretes digestive enzymes), then to the liver, gall bladder, and ultimately the small and large intestines. In this way the liquids and solids we consume are metabolized. Metabolism is the body's process of converting ingested substances to other compounds that can be used by the various body systems. While excessive consumption of alcohol, drugs or even overly rich food is not recommended, especially on a regular basis, it is possible to protect your system from some of the effects during times of occasional overindulgence. So what can be done naturally to support a healthy liver and thereby provide protection against the onslaught of toxins ingested during times of excess? Firstly, drinking alcohol responsibly and in moderation is advised. While one or two incidences of alcohol over-indulgence are a common reality for many, this should be kept to a minimum. Maintaining a healthy weight can also go a long way in supporting your liver and avoidance of smoking or uncooked mollusks (clams, oysters, mussels, scallops) is a good health practice to help protect the liver from harm. Drinking 8 glasses of water and engaging in moderate regular exercise can also go a long way to promote healthy digestion. Getting the right minerals and vitamins from a healthy balanced diet is also recommended. Herbalists and naturopaths from cultures all over the world have used traditional medicine for centuries to assist the liver and digestive system to regulate their functions. In more recent times, research has confirmed this traditional wisdom. There are now various published clinical studies demonstrating the ability of a range of herbs to support liver health. (Ferenci P, Dragosics B, Dittrich H, Frank H, Benda L, Lochs H, Meryn S, Base W and Schneider B (1989) “Randomized controlled trial of silymarin treatment in patients with cirrhosis of the liver”. J Hepatol 9: 105-113. Medline). Pre-Party Protect is a 100% safe, non-addictive natural herbal remedy containing herbs that have been chosen for their ability to support the liver and encourage balance during occasional non-recurrent times of excess and over indulgence. In this way Pre-Party Protect can safely promote systemic equilibrium in the body without the risk of dependency. Having been especially formulated by our team of natural health experts, Pre-Party Protect can be used to safely support the liver, in times when the digestive system may be under added strain – thus supporting the body’s natural ability to digest and assimilate food and drink during times of celebration! Containing a selection of herbs known for their supportive function in promoting liver and digestive health, Pre-Party Protect is presented in vege-capsule form, making it easy to ingest and hassle free! The formula contains only whole herbs, ensuring the bio-availability and balance of all the active ingredients contained in the remedy – exactly as nature intended! Taken before the party, Pre-Party Protect supports the healthy functioning of the liver and digestive system and protects all organs involved in stabilizing body systems after excess indulgence. Pre-Party Protect can especially benefit those individuals who are going to ‘indulge’ themselves at special occasions! Hang-Over Morning Mend – homeopathic remedy to specifically address the ‘morning after’! "Holidays always leave me feeling at my limit. I tend to do things in excess, and love to over-indulge at family events, but after a heavy holiday meal and a few beers I really don’t feel great and get a bit sluggish. This thanksgiving I used your product and what a difference! I used it on the day, and felt much much better. Now when I over-do it every now and then, I know I am giving my body a helping hand." "My wife and I are known as ‘party animals’ by our friends. We love to go out partying now and then. When we saw this product we knew it was for us, now when we go out to celebrate, we also know that we are being responsible and taking care or ourselves too!!!! Thank you!" "The guys in my fraternity used to rag me for not living it up with them. It was just that I didn’t want to over-indulge, cause it would upset my body and I am an athlete. Since I started using your product, I feel like I have a natural back-up and one or two hours partying doesn’t leave me feeling awful afterwards. Thanks for a great remedy." "I bought this as a present 4 my dad, who occasionally has one 2 many! I have noticed such an improvement, that I have taken it too b4 a night out with friends, don’t tell him and when I go back to college I’m taking a bottle with me too! Thanks so much 4 a great natural product!" Silybum marianus (Milk thistle) Milk thistle seeds contain a bioflavonoid complex known as silymarin. (Wagner H, Horhammer L, Munster R. "The chemistry of silymarin (silybin), the active principle of the fruits of Silybum marianum (l.) Gaertner", Arzneim-Forsch Drug Research 1968; 18: 688-96.) Silybin is the most active and is largely responsible for the benefits attributed to promoting liver health. (Ferenci P, Dragosics B, Dittrich H, Frank H, Benda L, Lochs H, Meryn S, Base W and Schneider B (1989) “Randomized controlled trial of silymarin treatment in patients with cirrhosis of the liver”. J Hepatol 9: 105-113[Medline]). Recent studies have investigated Silymarin for its positive properties with respect to alcohol in particular. (Feher J, Deak G, Muzes G, Lang I, Niederland V, Nekam K and Karteszi M (1989) “Liver-protective action of silymarin therapy in chronic alcoholic liver diseases”. Orvosi Hetilap 130: 2723-2727. Medline). According to further animal studies, milk thistle extract (silymarin) may also serve as an antioxidant further encouraging liver vitality. (Sonnenbichler J, Mattersberger J and Rosen H (1976) “Stimulation of RNA synthesis in rat liver and isolated hepatocytes by silybin, an anti-hepatotoxic agent from Silybum marianum” L. Gaertn. Hoppe Seyler's Z Physiol Chem 357: 1171-1180 Medline.). Althaea officinalis (Marshmallow) The botanical name of this herb comes from the Greek word "altho," which means "to cure." Marshmallow contains large sugar molecules called mucilage, which are thought to exert a soothing effect on mucous membranes (such as those lining the stomach and digestive system), and this is the basis of most proposed uses of the herb. (Rosik JK , Kardosová A , Toman R , Capek P . “Isolation and characterization of mucilages from Althaea officinalis L. and Malva silvestris L., ssp. Mauritiana” (L.) Thell . Cesk Farm . 1984;33:68-71). References document the plant's efficacy as a natural anti-inflammatory for the Gastro-Intestinal tract. (Blumenthal M, Goldberg A, Brinckmann J, eds. “Herbal Medicine: Expanded Commission E Monographs . Marshmallow leaf”. Austin, TX: American Botanical Council; Newton, MA: Integrative Medicine Communications; 2000). Ulmus fulva (Slippery elm) Slippery Elm has a high mucilaginous polysaccharide content (50%), providing a protective lining in the stomach and exerting a calming effect when used internally as a demulcent (a substance found to be soothing to inflamed mucous membranes). Additionally, animal studies have shown an extract of Slippery elm to be beneficial in promoting liver health and systemic balance in the liver. (Lee SJ, Oh PS, Ko JH, Lim K, Lim KT. “Protective effect of glycoprotein isolated from Ulmus davidiana Nakai on carbon tetrachloride-induced mouse liver injury”. Journal of Pharmacy and Pharmacology. 2006;58(1):143-152). Pre-Party Protect contains no gluten, artificial colors, flavors, preservatives or animal products. Note: Pre-Party Protect contains herbs in concentrated therapeutic dosage, especially formulated by our team of natural health experts to protect the liver and digestive system before a ‘night on the town’ or before rich food and alcohol consumption. To address specific common problems after a night of over indulgence, you may wish to try our Hang-Over Morning Mend homeopathic remedy. Take two capsules three times a day (beginning on the day of the party) and during the day after. Can be used with Hang-Over Morning Mend for acute problems to concentrate directly on the woes of a hangover. Safety during pregnancy and breastfeeding has not yet been determined. Please note that regular or excessive alcohol consumption leads to liver disease and other health and social problems. Drink alcohol responsibly and never drink and drive. 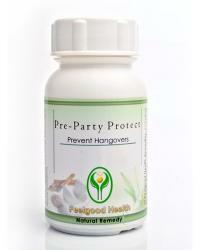 As with many effective herbal treatments, Pre-Party Protect begins to support the healthy liver almost immediately. Pre-Party Protect is presented in all-herbal vege-capsules that facilitate rapid absorption through the stomach and into the liver. This means that natural liver support and systemic health is encouraged from the start. During times of occasional over-indulgence, Pre-Party Protect will support the body – helping to promote feelings of natural ‘detox’ through liver support, thus naturally helping to cleanse and protect the system and promote consistency during and after a time of excess consumption. One bottle of Pre-Party Protect contains 60 vege-capsules and can therefore be used on five different occasions.